Learning Science are pleased to announce over a dozen new bioscience interactive resources for Autumn 2018, covering topics including microbiology, immunodetection, lab equipment and more. These resources expand our popular bioscience pre-lab library and have been included at no extra cost. The library is available now, ready to help take your bioscience teaching labs to the next level. These are important but relatively high-stakes protocols where a mistake at any stage could lead to poor results which may not become apparent until hours or days later. For this reason, students may have low confidence in these techniques and be unwilling to perform them in the lab without continual support from demonstrators. 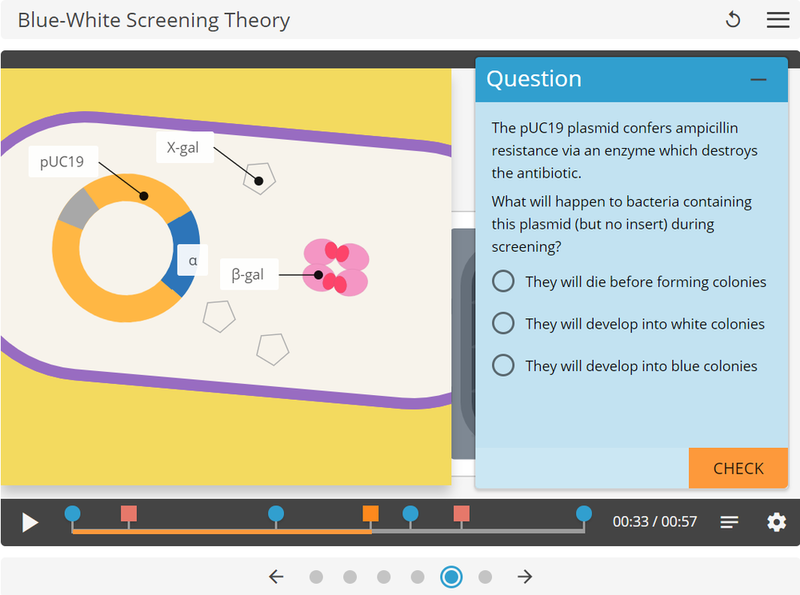 These interactives help students prepare by guiding them stepwise through the protocols. Students are presented with clear, discrete decisions, and they can learn the consequences of their actions through visual and written feedback at every stage. For example, they can see what happens if they pour agar too quickly into a Petri dish, flame sterilise the wrong part of an inoculation loop or forget to light a Bunsen burner when aseptic conditions are required. It’s important to be able to perform these techniques with competence, but for higher-level understanding, students must consider the “why”. For this reason, students are frequently asked questions on the rationale for various actions performed throughout the protocol. This way, they can move from “recipe-following” to a more flexible and comprehensive understanding of each technique before performing it in the lab. ELISAs and western blotting are relatively advanced procedures for students to carry out, so preparation is especially important for students to carry them out confidently and successfully. These detailed resources focus on sandwich ELISAs and wet transfer western blotting. The ELISA resource covers immobilisation, probing and detection of antigen as well as correct use of assay controls. The western blotting resource includes sections on blotting sandwiches, electrophoretic transfer, immunoblotting and detection methods. As with all of our pre-lab interactive resources, there are questions and feedback available throughout to test student understanding and improve knowledge retention. This interactive builds upon a pair of resources we have on PCR theory and practice by exploring quantitative applications of the technique. Students learn about fluorescence detection methods, explore parts of an amplification plot and what each part means in terms of activity within the PCR tube, then compare and contrast endpoint PCR and qPCR. Like all our pre-lab resources, this interactive is customisable to suit your lab needs. The resource by default covers use of SYBR GreenⓇ and TaqManTM hydrolysis probes as qPCR fluorescence detection methods. However, upon request, we can select just one of these to focus on, or we can work together to develop a new page using a different fluorescence detection method. We are always happy to discuss tailoring resources to the needs of your students. The new blue-white screening resource was requested by our partners at Coventry University. We already had a popular suite of cloning resources but blue-white screening was only a passing reference in one of these. This year we have developed a fully fledged resource helping students understand all aspects of blue-white screening theory. From the basics of the lac operon and beta-galactosidase, to selecting which reagents to include for a successful screen and explaining each outcome in terms of transformation success. The role of water baths and analytical balances may be relatively straightforward but that doesn’t mean their use is always intuitive for a new student. Without guidance, things can and do go wrong. This impacts not only the quality of results but could be potentially hazardous to the student or reduce the lifespan of the equipment. We have added two new resources on water baths and using an analytical balance to our bioscience libraries. They give students an opportunity to test out various combinations and see the effect of proper and improper use. For example, they can see how air currents affect balance readouts, or how the position of a sample tube in a water bath influences heating success. Moles and molarity are core concepts across biosciences and chemistry, but they can be tricky for new students to get a handle on. This Smart Worksheet takes students back to basics. It helps students familiarise (or refamiliarise after a long summer!) themselves with definitions, formulae and calculations surrounding moles and molarity. As with all our other calculation practice Smart Worksheets, your students will have multiple opportunities to practise in a low-stakes, formative environment. They’ll receive feedback at every stage, specific to their answer input. These resources are live now to all our customers, ready for embedding within your VLE. You can explore the full list of Learning Science pre-lab interactives in biosciences and chemistry, including the goal and an overview of each resource on the resources page of our website. What bioscience topics would you like to see in the Learning Science library? Let us know! We are currently researching ideas for the 2019/20 academic year and are always happy to receive academic input. To arrange a FREE 30-day full trial and/or demonstration at your university, get in touch via our website or email info@learnsci.co.uk.